Chemical processes occurring on the fluid/fluid interface can be studied and enhanced by means of efficient droplet generation. 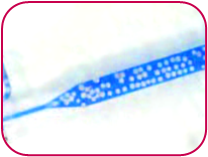 An increasing demand is emerging for effortless microdroplet generation. In response to this demand, the viability of our common flow chemistry instruments to be used as microdroplet generator has been analysed by FutureChemistry using our short quench microreactor. In contrast to homogeneous reaction mixtures, some reactions are carried out on the liquid-liquid interface. Offering a large increase in reaction rate and greatly facilitating work-up as the synthesised product collects in one of the fluid phases. One example is the cleavage of esters at the toluene/water interface, thereby enhancing the reaction rate while continuously extracting the product into the water phase. Thus, a large interfacial area is crucial to reaction speed-up. In batch, droplets can be generated through mechanical stirring. However, continuous flow offers the added advantage of precise control over droplet size and diameter distribution. FutureChemistry is also a specialist in producing more customised and dedicated flow systems. 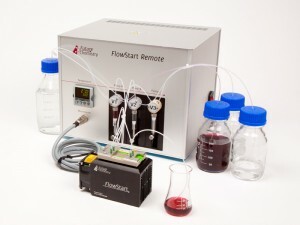 In collaboration with the VU University Amsterdam, we developed the FlowStart remote. The FlowStart remote is a flow system that can be used remotely through an online control platform. This custom made system gives high school students access to flow chemistry without safety risks. Students can synthesise, optimise and analyse a pH-dependent dye, methyl orange, from their computer. This web experiment can be accessed from any location in the world with internet access. The synthesis of azides is a key reaction in organic chemistry, as it provides a good pathway towards triazoles through the Huisgen azide-alkyne cycloaddition. Traditionally, this reaction is carried out using a variety of azide reagents, which can be explosive and release toxic gas. The dying of fabric using azo dyes in a continuous process is often performed by treating fabric (soaked in a phenolate solution) with an aryl diazonium compound. This method circumvents the need for dissolving the dye, but suffers from the instability of the diazonium species. However, in a continuous process it is advantageous to synthesise the diazonium compound in a continuous matter as well, without having to store the diazonium solution under freezing conditions to prevent denitrogenation. A convenient and selective way of forming a carbon-carbon double bond is through the Wittig reaction and its modifications. In this example, a two-phase system was used. The increased surface-to-volume ratio in the microreactor led to increased mass transport and faster overall reaction rate. – Flow Process Development & Optimisation. A convenient and selective way of forming a carbon-carbon double bond is through the Wittig reaction and its modifications. Conventionally, this reaction is a two-step process, where the Wittig salt is treated with a base to obtain the reactive phosphonium ylide species, with subsequent workup and addition of the aldehyde. Using base-stable compounds, the reaction can be performed as a one-pot procedure as well. In batch, this two-phase system suffers from irreproducibility issues due to uncontrollable mixing behaviour. In continuous flow chemistry, this translates to a plug-flow system with the advantage of added control over the two-phase system. 3) Scaling up to preparative synthesis. Org. Process Res. Dev., 2009, 13 (5), 1003-1006. The synthesis of α-ketone bromides is a useful reaction in organic chemistry, as it provides a good pathway towards α-substituted ketones through bromide substitution. Traditionally, this reaction is difficult to control due to its fast reaction rate and exothermic character. As a result, the brominated ketone easily reacts further to the double-brominated product. In batch, side product formation is largely overcome by controlled reagent addition and the use of mild bromination reagents (instead of bromine) such as N-bromosuccinimide, whose synthesis again requires the use of bromine. Direct α-ketone bromination with bromine limits batch scale-up, but has been shown to be possible in continuous flow. The latter has the added advantage of handling all toxic and corrosive reagents inside a closed system. – Out scaling to kg/day production.